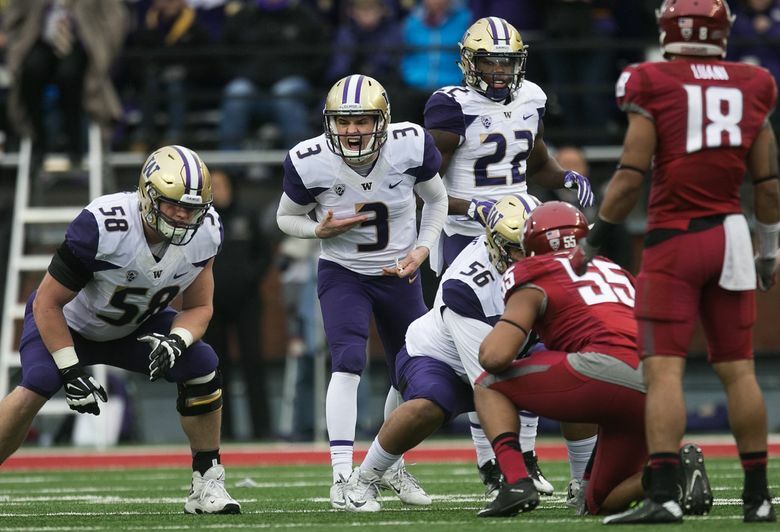 Washington quarterback Jake Browning (3) changes a call at the line of scrimmage during the Huskies’ victory over Washington State in the 2016 Apple Cup. The Apple Cup is again primed to be the game of the year in the North. We’re one week from the start of Pac-12 media days in Hollywood. Washington’s Chris Petersen, Jake Browning and Keishawn Bierria will take the stage next Wednesday to represent the reigning conference champions, and for the first time in the Pac-12 era the Huskies should be selected as the definitive favorites to repeat as the North champions. Five days later, on July 31, the Huskies open their fourth fall camp of the Petersen era. Stanford and Oregon owned the Pac-12 for the first half of the decade, but 2016 began to tilt control back to the traditional powers — and UW and USC don’t look like they’re going away any time soon. The Huskies and Trojans don’t play during the regular season, but in a vote of conference media members they’re expected to be overwhelming favorites to meet in the Pac-12 championship game. North game of the year: Apple Cup, Nov. 25 at Husky Stadium. With a rebuilt secondary, the Huskies will try to stymie Luke Falk and Wazzu’s Air Raid once again. Team on the rise: Oregon State. The Beavers have a ways to go entering Gary Andersen’s third season in Corvallis, but don’t expect them to be the pushover they’ve been. RB Ryan Nall might be the most underappreciated player in the conference, and the Beavers return a solid core of their defensive front seven. A .500 season isn’t out of the question for OSU. Team on the decline: Cal. Things are likely to get worse before they get better in Berkeley. In his first head-coaching job, former Washington defensive coordinator Justin Wilcox hired Eastern Washington coach Beau Baldwin as the Bears’ offensive coordinator. They’ll have to break in a new quarterback and hope to improve a defense that ranked as one of the worst in conference history against the run (allowing 272.8 rushing yards per game). Don’t sleep on: Stanford. We’ll know a lot about Stanford post-Christian McCaffrey when the Cardinal travel to play USC in Week 2. Keller Chryst settled in as the starting quarterback midway through 2016 and helped Stanford win its final six games. He’s recovering from a major knee injury in Stanford’s Sun Bowl victory over North Carolina. Stanford isn’t picked higher here because most of its toughest games are on the road: USC (Sept. 9), Utah (Oct. 7) and WSU (Nov. 4). Stanford does host UW for a Friday-night showdown Nov. 10. Easiest schedule: Washington. The Huskies should be favored in every regular-season game, and they might not get a real test until the end of October when they host UCLA. All those up in arms about the Huskies’ inclusion in the Final Four last fall could be singing a similar tune about UW’s soft schedule come this December. Toughest schedule: Cal. The Bears open at North Carolina and host Ole Miss and USC during back-to-back weekends in September. New faces: Wilcox, a former Oregon safety, seemed a logical choice to take over in Eugene. The Ducks instead hired South Florida’s Willie Taggart, whose “Do Something” mantra is sure to succeed “Just Do It” as the world’s most inspirational slogan. Don’t forget about: Royce Freeman, Oregon. Freeman’s return for his senior season was a bit of a surprise. After rushing for 1,836 yards and 17 touchdowns as a sophomore in 2015, his production dipped considerably last season (945 yards, 9 TDs) while playing injured and behind a young line. North offensive player of the year: Luke Falk, WSU. With 89 career touchdown passes, Falk needs just 27 more to match Matt Barkley’s conference record. North defensive player of the year: Vita Vea, UW. Mount Vita is a rare talent who showed flashes of his vast promise last season. If his production matches his potential this year, he could put together one of the best seasons ever by a UW defensive lineman. Bryce Love, RB, Stanford: The North is loaded at running back with Nall at Oregon State, Freeman at Oregon, Myles Gaskin and Lavon Coleman at UW, among others. Behind Stanford’s monster line, Love figures to join that elite group this year. Tavares Martin Jr., WR, WSU. Gabe Marks and River Cracraft are gone and, well, someone has to catch all those passes, right? Jordan Miller, CB, UW. The biggest question about the Huskies is the secondary, where Miller and redshirt freshman Byron Murphy are expected to take over as the starting cornerbacks. The Huskies had perhaps the best secondary in school history in 2016, and there will be a drop-off from that — it just might not be all that big.